The Monday Night Thread is Back! Welcome back to the Monday Night Thread. We’ve missed chatting with you, so we have many questions tonight……. What did you do on the 4th of July or on Canada Day? Any great adventures so far? Seriously, how many times have you seen DMC so far? Re: The Monday Night Thread is Back! Liz wrote: Welcome back to the Monday Night Thread. We’ve missed chatting with you, so we have many questions tonight……. Any great adventures so far? Yup, went to Californy with my niece to see Johnny on the red carpet will post the pics below on next message. Seriously, how many times have you seen DMC so far? Going second time this weekend. Saw it 3 times this weekend and am going again on Wednesday. Hi Shadow and Kittycat. I hope to go for my 2nd viewing tomorrow and see it on a bigger screen. I know there are many things I missed the first time around. More Me!! Still waiting...notice I am still smiling..
Me with my head cut off, she said I can't get all of your head in. I answered, get the cement print, never mind me!! 3 times and will see it again, sneaking off for the matinee tomorrow. Well, Kittycat, that was an adventure of a lifetime, eh? I so enjoyed meeting you that day. Raven wrote: 3 times and will see it again, sneaking off for the matinee tomorrow. I hear "second time's a charm". I think there might be more to this movie than meets the sharp eye. I'm so glad the Monday night thread is back! My summer has been extremely busy. I've bitten off more than I can chew between work, school, and personal plans. But, I'm wading through and trying to stay (sort of) caught up on all the Johnny news. I didn't do anything on the 4th. Well, I take that back. Mr PhD and I bought a 42" plasma television on the Saturday before the 4th. Most of the weekend (as well as Monday and Tuesday) was spent hooking everything up and re-arranging the living room furniture to accomodate our new tv (and cleaning up the dirt that was revealed when we moved the furniture). Great adventures.... I had a business trip to Montana, and made a couple of side trips to Yellowstone National Park. It was spectacular. We're already planning another trip out there (when our vacation won't be interrupted by meetings). My next adventure will be next week. I must survive my SIL and her wedding. I haven't read much this summer. I started Shantaram, but haven't had an opportunity to finish it yet. I read most of a book about grizzly bear attacks (scary! ), too. I wanted to read the next ONBC book, but I'm afraid I'm going to have to sit this one out. I've seen DMC twice and plan to go back again on Saturday. ~What's your barn burner about, kitty? "Because, you know, it seems to me that, I mean, except for being a little mentally ill, she's pretty normal"
I can tell you there is so much going on even I cannot know all of it. But I do have a question for you all. Who is Davey Jones heartache and what is your proof???? PhD wrote: I'm so glad the Monday night thread is back! You've had a very busy summer so far, PhD. I've been told I should go to Yellowstone--but we're waiting until the kids are gone. I think they'd be bored. And reading a book about grizzlies doesn't seem like a good thing to do prior to going to Yellowstone. Or did you read it afterwards? I've had an extremely busy summer so far--but they seem to always go that way with kids in the house. I've been to two amusement parks--one Disneyland. And you all know about that adventure--the one of a lifetime. 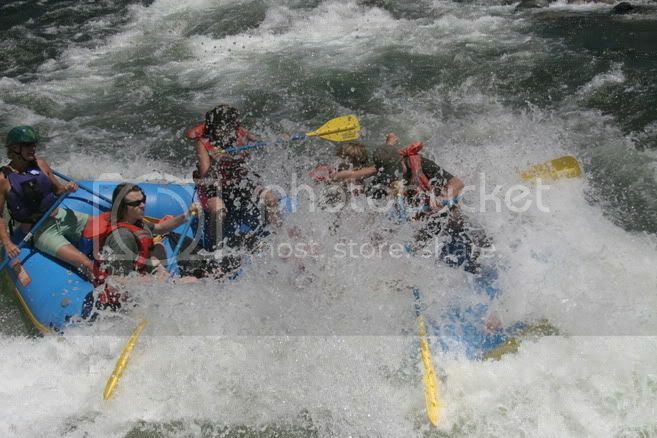 and I went on a rafting trip with my family. It was the first time for my son. He fell out--sort of purposely in the biggest rapid on the river--Satan's Cesspool. Finally able to catch the Monday Night Thread, I am usually very busy around this time. Usually always busy with my nightly Johnny viewings. My summer has been a combination of relaxing and exciting so far. Just got back from a wonderful and lovely week long vacation last month down in Panama City Beach, Florida. Hope to go back again one week this October. After that, I have been mighty busy catching up with all the news and lovely pics here on the Zone. Spent the 4th of July with the Earl of course, what better way to spend the holiday! So nice to finally own a copy of this magnificent film! I have not seen DMC just yet, but I will definetly be catching a matinee on Wednesday! I CAN'T WAIT to see what all the Captain will be up to this time around! I have been avoiding all of the Zoners' reviews of the film, will catch up as soon as I see the film. Don't want it spoiled for me. After that, it will just be a nice, relaxing summer full of relaxing afternoons out in the sun! Johnny & Vanessa.... The Most Beautiful Couple in Hollywood!!! Howdy, Noodlemantras! Just checking in briefly for the moment since I ended up with an impromptu houseful for dinner tonight... It's good to see the Monday Night Thread back in action and I'll be back later when my dinner guests have gone. My biggest adventure of the summer was definitely the DMC premiere at Disney and meeting up with new and old Zoner friends! KittyCat I enjoyed meeting you and ZsaZsa as well! I haven't been able to read anything other than GO so far this summer, just too busy. I saw DMC on opening day and probably won't be able to get back until next weekend due to the intrusion of real life... I do plan to see it many more times though to pick up all that I missed on the first viewing. I have enjoyed reading all the commentary and everyone's different viewpoints. Carry on, mates...back in a bit!